-hmmmmm, we never really talked about our surroundings to you. So, This is one of the nice things in our neighbourhood! 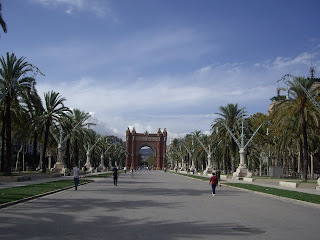 We are very close to the plaza Tetuan and just five minutes away from vonblum is the "Arc de Triunfo" from Barcelona. It was built as the entrance gate for the 1888 Universal Exhibition so it is not, strictly speaking, a triumphal arch as it was not built to commemorate any military victory. Nevertheless, it is built and named as a triumphal arch! If you want some more insider information on this touristic site, follow this link!